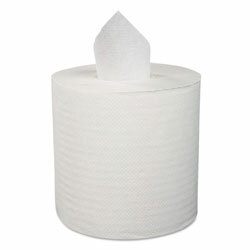 If you are buying supplies for your business’s restrooms, go with center-pull paper towels. I’ve found that they are the cheapest and most efficient type of hand drying amenity you can get. Boardwalk is the janitorial supplies brand that I use for paper towels. Customers have rated the Boardwalk 6400 centerpull paper towels a whopping 5 1/2 out of 6 stars because ReStockIt.com’s price on the item is unbeatable, and the product itself lasts longer than other types of paper towel. You can get a case of 6 two-ply centerpull paper towel rolls for $22.49 as of this writing; that’s only $3.75 for about a month of normal paper use. If you already use a different type of paper towel with other dispensers, try buying a case of the Boardwalk 6400 centerpull towels and a dispenser. Centerpull paper towel dispensers are the cheapest type of dispenser there is, and the savings in paper usage will pay for your old push-lever, electric dispenser or blow dryer you have now.